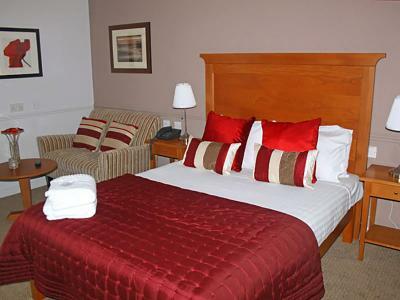 Gomersal Park Hotel, near Leeds, is a stylish hotel located just 8 miles from Leeds and Bradford. 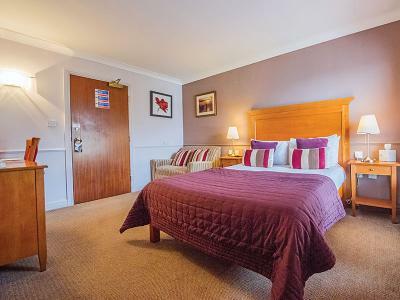 Set in beautiful grounds, in the heart of Emily Brontë’s Wuthering Heights country, Gomersal Park Hotel is only 5 minutes drive from junctions 26 and 27 of the M62 motorway and 10 minutes from junction 42 of the M1. All rooms have complimentary Wi-Fi and flat-screen TVs with DVD players. Signature suites feature sunken baths and separate lounge areas. Massimo’s is the hotel’s Italian restaurant serving up delicious pizza and pasta dishes. The Dream Spa and health club offers an indoor swimming pool, gym and full thermal suite. The historic Red House Museum, with fascinating Brontë connections, and Oakwell Hall, an Elizabethan manor house set in a 110-acre country park, are just a 10-minute walk from the Gomersal Park Hotel. The Royal Armoury Museum in Leeds and Bradford’s National Media Museum are both within easy driving distance. National Parks the Yorkshire Dales and the Peak District are an hour away by car. 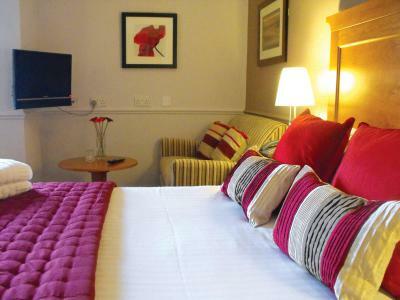 Newly refurbished, stylish bedrooms offer complimentary Wi-Fi and flat-screen TVs with built-in DVD players. There are posture-sprung beds for additional comfort, and writing desks and sofas also feature in all rooms. Room service is available. 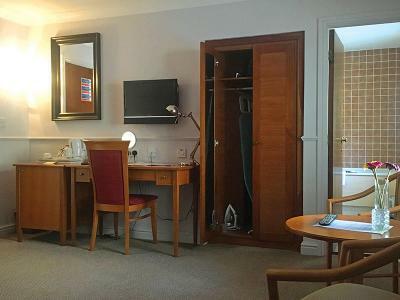 Contemporary style en suite bedroom offering free Wi-Fi, digital TV/radio, DVD player, writing desk, direct dial telephone, ironing station, tea and coffee making facilities, toiletries, and hairdryer. Contemporary style en suite bedroom with twin beds, offering free Wi-Fi, digital TV/radio, DVD player, writing desk, direct dial telephone, ironing station, tea and coffee making facilities, and toiletries. Contemporary style en suite bedroom offering free Wi-Fi, digital TV/radio, DVD player, writing desk, direct dial telephone, ironing station, tea and coffee making facilities, toiletries, and hairdryer. 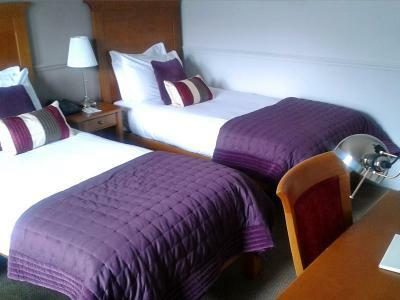 Triple rooms feature one double bed and one single bed. Spacious superior room with double ded, free Wi-Fi, lounge area, digital TV/radio, DVD player, writing desk, direct dial telephone, ironing station, tea and coffee making facilities, and toiletries. Contemporary style en suite bedroom with twin beds, offering free Wi-Fi, digital TV/radio, DVD player, writing desk, direct dial telephone, ironing station, tea and coffee making facilities, and toiletries. The Accessible Twin Room offers extra space and features handrails, low level facilities and an accessible toilet in the bathroom. This room is located on the ground floor, next to reception. Please note that the room does not have a walk-in bath or shower. Exit at junction 27 and take the A62 for Huddersfield. Continue past two sets of traffic lights. At the third set of lights, by the Greyhound Pub, turn right onto the A652. After approximately a mile turn right into Moor Lane. The hotel is immediately on the left. Exquisitely prepared Italian dishes are served up in Massimo Restaurant complemented by an excellent selection of fine wines, champagne and beers. Start with bruschetta, the classic Italian appetizer, to capture the flavours of tomato, shallot, basil and mozzarella. Move on to the speciality pasta dish, rosa farfalle: salmon sautéed with red pepper, chilli, sun blushed tomato and farfalle pasta, or try something more unconventional like crab and squid ink. Finish with the popular coffee-flavoured Italian dessert tiramisu. Pizzas are prepared from scratch, hand rolled and freshly baked in speciality stone ovens. True to its name, the Vesuvius pizza features chillies, jalapenos, pepperoni, Tabasco and red onion. Risotto dishes, seasonal and daily specials, grills and side salads are also available. In the summer, dining at the Gomersal Park Hotel reveals an altogether different flavour. Take a seat in the fresh open air – sunny or shade – and dine al fresco. There is a terrace area at the front of Massimo Italian Restaurant, which offers an oasis of calm to spend a long summer evening after exploring the local area. The unique surroundings of the Gomersal Park Hotel present a wonderful setting for private dinners and celebrations. The hotel caters for reunions, anniversaries, family gatherings, birthday parties, charity and club events, and business dinners. Choose from a range of private rooms, each with its own individual character. Call Classic British Hotels on 0844 967 0984 for advice and let us help you organise a memorable private dinner. Spa access: day access to the Spa is charged at £20.00 per person. Access is complimentary when you book a spa treatment (per person on any given day; excludes nails treatments). A full range of spa treatments, using Elemis and Leighton Denny products, are available to book. The Museum houses over 8,500 objects across five galleries – War, Tournament, Oriental, Self-defence, and Hunting – with 70,000 examples of arms, armour and artillery. Highlights include Japanese Tokugawa armour, a Burmese bronze cannon, elephant armour (the largest animal armour in the world), German ‘Gothic’ style man and horse armour and Henry VIII's horned helmet. In the heart of Bradford, UNESCO City of Film, the National Media Museum is home to over 3.5 million items of historical significance. The Museum is charged with looking after the National Photography, National Cinematography, National Television and National New Media Collections. The UK's first IMAX, Pictureville - with Europe's only permanent, reguarly programmed Cinerama installation - and Cubby Broccoli cinemas are all here. Visited often by Charlotte Brontë and immortalised in her novel Shirley, the Grade II* listed Red House Museum was the home of the Taylor family in the 19th Century and it was Mary Taylor, daughter of the house, who was a close friend of the famous novelist. Includes elegant period rooms, award-winning recreated 19th Century gardens and interactive exhibitions in restored outbuildings. Built in 1853, Oakwell Hall is an Elizabethan manor house furnished as a family home in the 1690s and offers visitors a fascinating insight into a post-English Civil War household. Set in 1690s-style gardens, 110 acres of country park surround the hall. There is a visitor centre, playground and countryside centre. Another must see for those interested in Charlotte Brontë. Gomersal Park Hotel’s 12 conference suites are suitable for a range of functions; from training seminars, to theatre-style presentations for up to 200 guests. Each suite has high spec AV equipment to ensure a professional and successful outcome. Gomersal Park Hotel enjoys a picturesque setting whilst having direct access to both Leeds and Bradford via the nearby M62; the M1 motorway is also nearby. There is free Wi-Fi throughout the hotel and ample free parking on-site.